After a lengthy campaign to promote calcium and vitamin D intake for bone health, most of us have jumped on the bandwagon and are supplementing our diets with these two nutrients—especially as we get older. In fact, we’ve been told that as we age, osteoporosis becomes more of a threat. This disease makes bones fragile and ups the risk for fractures that can significantly reduce the quality of life for someone who has to heal from a broken bone. So we try to keep our calcium and vitamin D levels up. But instead of just adding vitamin D and calcium supplements to your diet, you can actually get lots of the nutrients you need to keep bones strong by eating certain fruits and vegetables. The phytonutrients in fruits and vegetables can also play a significant role in helping to stave off osteoporosis. According to recent research, published in time for National Osteoporosis Awareness and Prevention Month, which takes place every May, increasing your fruit and vegetable intake positively affects bone health through a number of different mechanisms. Fruits and veggies are full of micronutrients essential for bone formation—exactly what you need if you’re trying to offset bone loss due to the effects of aging. Fruits and veggies contain magnesium, calcium, potassium, vitamins A, C, E, and K—to name a few. These healthy foods also lower dietary acid levels. Most North American diets are acidic, and this can be bad for bones over the long haul. Given enough time, acidity wears away bone mass causing a drop in bone density. Fruits and veggies are alkaline and help to offset the damage done to bones due to eating a diet that’s too acidic. 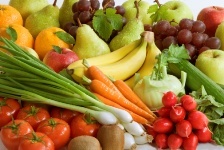 Fruits and veggies are also full of antioxidants. These antioxidants reduce inflammation and oxidative stress in bone tissue. The less inflammation in bone tissue, the better. Oxidative stress can potentially damage any type of cell in your body and this includes bone cells. Because fruits and veggies contain some potent antioxidants, they have a big role to play in protecting your bone cells against oxidative damage. Fruits and veggies have another more bone-strengthening ability: their phytonutrients can literally stop bone reabsorption from happening. As you grow older, bone reabsorption can become accelerated, with too many vitamin and minerals being lost from bone. Time to get fruits and veggies into your daily diet! One study recommends that women who are post-menopausal should get nine servings of fruits and veggies every day. For most of us, five servings are recommended. Gunn, C.A., et al., “Midlife women, bone health, vegetables, herbs and fruit study. The Scarborough Fair Study protocol,” BMC Public Health. January 2013; 10 (13): 23. Shin, S., et al., “A dairy and fruit dietary pattern is associated with a reduced likelihood of osteoporosis in Korean postmenopausal women.” Br J Nutr. April 2013; 12: 1-8.